LAS VEGAS, NV. (THECOUNT) — Police released the identity of the man shot and killed as seen in a shocking bodycam video released by the Las Vegas Metro Police. One of the suspects, Fidel Miranda, 23, was shot and killed at the scene. Another suspect, Rene Nunez, 30, was taken to the hospital to be treated for a gunshot wound. 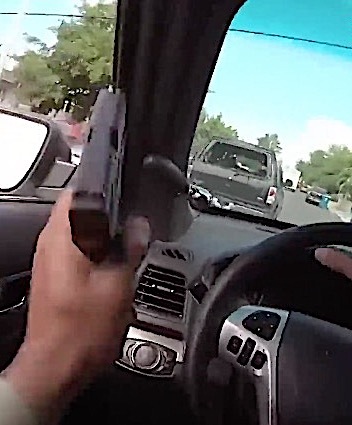 The unbelievable bodycam footage shows Metro officers, William Umana, 37, and Paul Solomon, 46, engaged in a high-speed chase as one of the officers shoots at the suspect’s vehicle through the window of his police cruiser. The pursuit ends in a crash outside an elementary school. The officers have since been placed on administrative leave pending an internal investigation. Miranda was pronounced dead at the scene of the crash from a gunshot wound.